"Maybe I Have AIDS" pin; Marcia Edwards, Glenda Smith, Juanita and Alexandra Juhasz, frame grab from WAVE's "We Care" video; Juanita Imran. WAVE (Women’s AIDS Video Enterprise) was a community of women impacted by and living with HIV who came together in the 1990s to make tapes about the ongoing HIV/AIDS epidemic. They were part of a larger movement of AIDS activists and artists who used video to tell their stories and make an impact through direct interventions into the narrative being constructed around the emerging crisis. In the interview below, Juanita Irman (known as Juanita Mohammed in WAVE) speaks with former Visual AIDS programs manager Ted Kerr about her time with WAVE, the impacts of the project on her life and other projects she has been a part of related to gender, health, and HIV/AIDS. Irman’s work and love provides a model of how to honor and bear witness to women living with HIV. We celebrate Irman’s ongoing contribution and look to her as a role model of community engagement as part of LOVE POSITIVE WOMEN, a project initiated by Visual AIDS Artist Member Jessica Whitbread and supported by the International Community of Women living with HIV. LOVE POSITIVE WOMEN aims to acknowledge, love, and empower women living with HIV through public and private acts of love, caring and storytelling. Irman’s work is a lesson in how shared risk-taking and listening are vital. Visual AIDS: How did you come to be a part of WAVE (Women’s AIDS Video Enterprise)? Juanita Imran: I became involved with WAVE through my volunteer work with Brooklyn AIDS Task Force. There was a poster put up asking for women with and without HIV/AIDS to be part of a video project. I was interested because I went to college for cinematography and felt that people were more likely to learn about AIDS from a video because they could see and hear the information. Part of me wanted to create something that would make a long lasting impact. I also wanted to have more contact with women infected and affected by the disease. VA: What did being a part of WAVE mean to you? 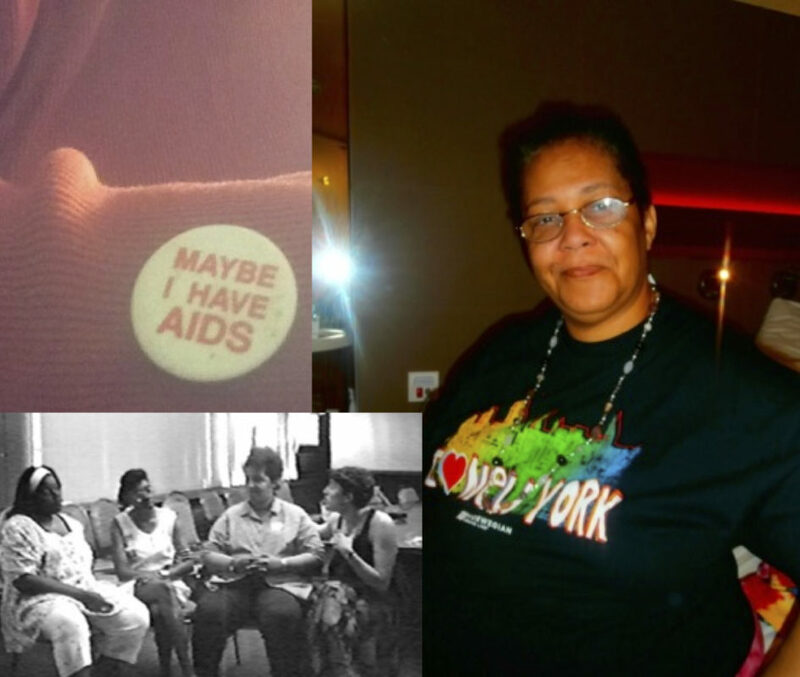 JI: Being part of WAVE for me meant exchanging ideas with a diverse group of women who had firsthand knowledge of HIV/AIDS either by being infected; affected through family or friends; or plain old human response/caring. It meant being able to go into my own community and interview people on what they know or did not know about the epidemic. I would be able to spend time with other women creating instead of gossiping, building instead of tearing down. I would be involved in something that would inform the community about this disease that was affecting everyone. The project gave me the chance to give access to women by creating the videos and by taking them out into the community myself. It gave me a chance to empower disenfranchised women by giving them face and voice not only by being in the video but being able to impart their ideas at screenings. VA: In an essay you wrote with fellow WAVE participant Alexandra Juhasz in which you reflected on your time as a member of WAVE, you mention the skills and confidence you gained from WAVE. Now that even more time has passed, what do you think of your time as part of WAVE? JI: For me, participating in WAVE was a major turning point in my life. Although I had worked with women before, I never felt the comradery I did with the women of WAVE. The members were all so different coming from diverse educations, cultures, poverty lines, employment, lifestyles, marital statuses, health issues and ideas. For the first time I felt I was involved in an activity that was helping the community, which would be seen. For once I could be independent but at the same time I was part of a group with the same goals, sharing and discussing what was going on around us. These skills led me to have the confidence to be a leader and role model for my daughter and granddaughters as well as my peers. I am not afraid to voice my opinions in a conversation or face the stigma that sometimes still comes from working with the HIV+ population. It allows me to be able to advise others to not give away their power or let anyone take their power. VA: After WAVE you made videos with GMHC, wrote about video and activism and stayed active in the work. Can you talk about the other projects you have done? JI: Beside the videos produced with GMHC, I have made videos on homosexuality, artist venues, “disabled” communities, drugs, community groups, ex prisoners. I have been able to participate in groups and panels on AIDS. As a caseworker with the Human Resources Administration I now work day-to-day directly with people with HIV/AIDS and their families. It has been great to see people overcome stigma and fear. It is great to see life expectancy and the standard of living improve. It has been a disappointment to see it become just a job instead of advocacy, to see clients care about the financial services before the social services. VA: Can you tell me more about the House of Moshood? JI: House of Moshood was part of the ball community. The ball community is a venue that consists of gays lesbians, bisexuals, drag queens and kings, transsexuals and now straight individuals who perform or model fashion. House of Moshood was not the first women House but it was the first House to be committed to women's issues. It was founded by Sandra Franklin (Sandy), whose idea was that there needed to be a place for lesbian women to be able to socialize without having to drink or drug. As a former member of the ball community, she believed women would be a nurturing influence to each other. So immediately the house of Moshood became open to lesbians, bisexuals, transwomen and straights. The members competed in ball categories and had two very successful balls of their own. Not only did we compete, we spoke and performed at events, women shelters, domestic violence shelters, colleges and many balls. VA: On your Facebook wall there is a photo of a button you wore on Day With(out) Art / World AIDS Day that reads, “Maybe I have AIDS.” Can you tell me about that button and why you wear it? JI: I picked up the “Maybe I have AIDS” button at one of the many street outreach events which used to happen. The first time I wore it I went to see an AIDS exhibit at the Brooklyn Museum and a white woman in her 40’s demanded to know why I would wear something so disgusting. I smiled and informed her I wore it to remind people that it was a disease anyone could get or have. She stormed away but others wanted to see and find out what the button meant. The last time I wore it was Day With(out) Art / Worlds AIDS Day to a small event on AIDS, this time a young Black woman practically fell down jumping away from me. She wanted to know why I would want people to know I had that disease. I then explained to her that I might or might not have the disease and that anyone could be infected and not know it. Friends that were with her began to tell her she was being ignorant. In both cases this visual tool caused conversation to take place about the issue. I still wear this button to remind myself and let others know that the epidemic is still here and anyone still can contract HIV. VA: As of late there are a lot of documentaries about the early responses to HIV. What do you think of them? JI: I think the recent block of documentaries and other media about the early response to HIV are positive. Positive in that they are tools to teach the public that the crisis is still a part of our lives. Those who were involved in the early years are reminded how much things have changed as well as how much has remained the same. The youth of today are presented with the cold ugly history of dying, discrimination, ignorance, and hate as well as the awesome legacy of love, humanity, advocacy, diversity, and sacrifice. The public can experience the history and early response through venues like HBO, Netflix, Public TV, and Sundance. We're witnessing a time when the public is experiencing the need for acts of advocacy; hopefully these venues will continue to lead the way. Unfortunately—in my opinion—I think this wave of productions is limited in that, for the most part, they are not viewed by those who need to see them. Instead I think they will be seen by historians, activists, a few community groups, artists, people willing to spend money and time on the arts. Many of the films and the exhibitions have been created by those with money, from this era, and few have been created by those who were there: the community groups, the infected and affected, the videographers. To me the problem is that the public does not know—or care to know—the disease or productions that exist. There is no big media coverage, I do not hear the community talking or gossiping about it. It is interesting to me that HBO has aired "A Normal Heart" and will air " Larry Kramer In Love and Anger" by Jean Carlomusto, a filmmaker who was a part of the earlier advocacy, not only as an video producer—but also as an activist. I would love to see documentaries and other media be produced by people with HIV. It is good for the future. Juanita Imran is the mother of Jahanara and Shah, YaYa (to her three grandchildren, Pharah, Kiomara and Jonathan). In 1989, she was part of the production for Women's AIDS Video Enterprises produced by Alex Juhasz. She produced numerous videos for Gay Men's Health Crisis's " Living With AIDS Show" and is a former Mother of the House of Moshood, from the ball community. She has spoken at community group venues, Lesbian and Gay Centers, the New York Public Library and schools. She now works for NYC's Human Resources Administration as a caseworker. In addition she produces documentary videos and volunteers with her life partner Henry Szczepanski around issues involving handicapped, homeless and HIV populations.